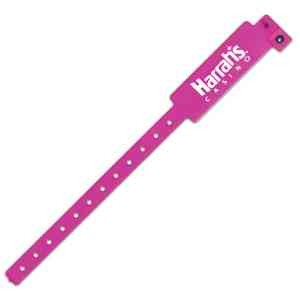 Same Day Service: Same Day Service - Keep security tight with this one time use, 1"H wristband. This item is excellent for extended wear and stays secured on the wrist with locking plastic snaps. Customize for any event with bar codes, customer numbering, or company name/logo. Waterproof fabrication makes it ideal for outdoor venues. Great for sporting events, concerts, and festivals. Recommended wear time is 7-14 days. Made in USA. Available in multiple colors.